There was once a time when the pinnacle of luxury was American. Duesenberg, Mercury, Packard, Cadillac, and indeed, Lincoln, dominated the early days of motoring, offering well to do customers the smoothest, most comfortable rides their hard earned money could buy. Typically reserved for celebrities, high ranking politicians and every other flavour of the world’s elite, these cars bathed their riders in luxury, comfort and elegance – and cemented their place in pop culture. But that thriving image wouldn’t last. Many American car brands became defunct – either going out of business or getting absorbed into a larger company. Fuel crises, economic turmoil, and the rise of competing brands out of Europe (namely Mercedes-Benz and BMW) saw these once great names flounder into relative obscurity, or burn out altogether. While Lincoln’s Continental remained a fairly consistent part of the brand’s lineup, later generations lost the style, presence and iconic nature the Continental was once known and praised for. With this latest generation of the Conti, Lincoln is making it clear they are trying to regain that lost glory. Let’s see if they succeeded. The new Continental bears an almost imposing presence on the road, with a size almost rivaling that of a long-wheelbase BMW 7-series (BMW M760Li reviewed here). The styling bears an homage to the iconic Continental of the 60’s, but features enough modern, artful touches to distinguish it further. The most prominent likely being the door handles built in to the beltline of the car. Even the metal arm which the side mirrors attach to seems like it was designed by an engineer who happens to have a degree in art as well. That is to say, it’s rather striking in design. Step inside the Continental and the elegance continues. Make sure you don’t shut the door all the way though - because the doors shut themselves. The cabin of the Continental has an undeniably premium feel – as it should. Soft, supple leather covers each seat. Nicely grained wood veneer, chrome accents and soft touch materials on the dashboard make the interior a very pleasant place to be. Our tester featured 30-way adjustable power seats. Yes, seats can be adjusted in 30 ways, including a split in the cushion to raise and lower each of your legs individually. All the door controls are relegated to switches on the doors, a-la Mercedes-Benz. But you can also tweak settings through the touchscreen and steering wheel buttons. Our tester was also equipped with the Rear Seat Package, adding a number of dials, screens and functions including massage. I would dare say the massaging function in the Continental is better than that of a BMW 7-series. The seats were also comfortable with lots of leg room. I should know – I fell asleep back there! All of the Continental’s transmission functions are relegated to buttons placed alongside the touchscreen interface. It’s a little odd at first but you get used to it fast – and it’s quite nice how much room the lack of gear shifter adds. It’s not exactly a sporty setup, but this isn’t a sporty car. In most situations, the transmission operates fine. It excels at pulling the car up to highway speed in a smooth, dignified, but powerful manner. But we find at lower speeds, especially in stop and go traffic, it can feel a little jerky – a no-no in a car of this nature. If it’s at all possible Ford, fit your new 10-speed gearbox in there. But other than the occasional low end jerk, the ride was smooth and almost floaty. Like what we’d imagine the ride from a classic Continental from the 60’s felt like – albeit far more refined with modern suspension and handling. If you push the Continental in a corner, it’ll handle it, but expect some noticeable body roll. Despite having a selectable “sport” mode, we feel the Continental excels most at what it does best – comfort. Lincoln has been in a tough spot for the past 20 years or so. A company once known for being almost the pinnacle of American luxury had to settle for tarted up, rebadged Fords for longer than anyone should have had to. The brand is pretty well established in the minds of the boomer generation, but we’re not sure how much appeal to a younger market there really is behind it. 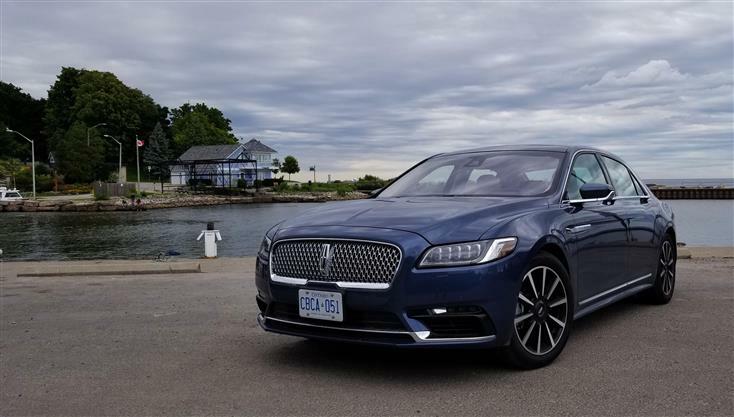 It’s unclear how Ford’s announcement of phasing out cars will affect the Continental, but for the time being, if the Continental is an indication of where Lincoln is headed, it might be safe to say, welcome back to the Luxury stage.